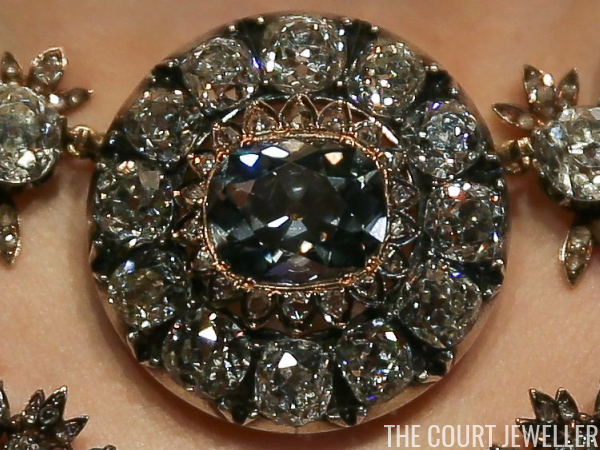 We've already covered two of the most spectacular jewels that will be sold at Sotheby's in Geneva this month: Catherine the Great's Bow Necklace and the Sky Blue Diamond Ring. Today, we're looking at a third lot from the sale, an unusual, impressive suite of jewels with roots in the Ottoman Empire. 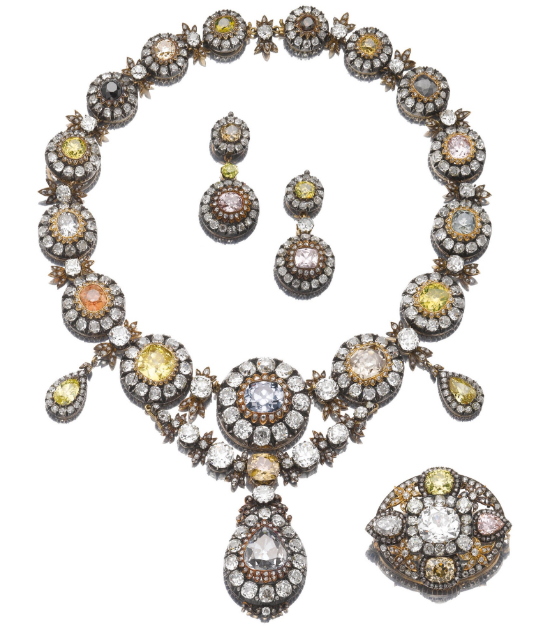 Here's how the auction house's lot notes describe the pieces being sold: "a necklace composed of a series of graduated clusters set with cushion-shaped diamonds of various tints, within frames of similarly shaped and rose near-colourless stones, alternating with foliate motifs, the front decorated with two pear-shaped diamonds of yellow tint within a surround of cushion-shaped stones, and a detachable line of cushion-shaped diamonds and foliate motifs, the central fancy brown-yellow diamond supporting a pendant set with a modified heart brilliant-cut fancy grey diamond, further accented with cushion-shaped and rose diamonds, length approximately 270mm, central cluster and clasp detachable, one small diamond deficient; a pair of earrings, later post fittings; and a brooch." 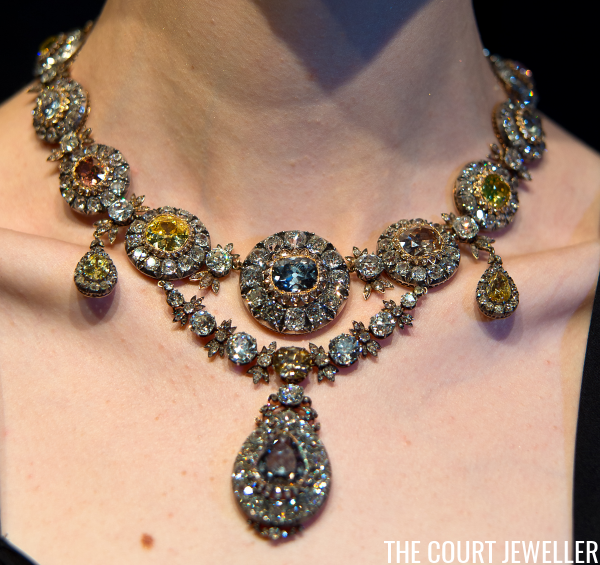 The pieces are not only unusual for their varied colored diamonds; they also have royal provenance. They were made in the 1870s for Emine Hanim, the wife of Khedive Teufik of Egypt. The pieces were a gift to the Khediva in honor of the birth of her son, Abbas II. (He later succeeded his father as khedive -- and famously gave a very familiar tiara to a royal princess.) The man who gave the pieces to the Khediva was one of the most powerful men in that part of the world: Abdul Hamid II, ruler of the Ottoman Empire. The Khediva ended up exercising some power of her own: after her son's accession in 1892, she was given the title of Valida Pasha and became one of her son's most important political advisors. 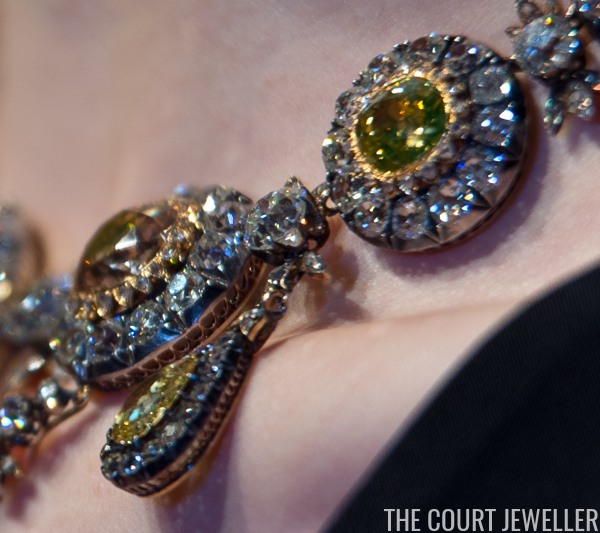 But the diamonds set in these pieces may have an even longer history. According to tradition, they were given by Empress Catherine I to Sultan Ahmed III during the negotiations to end an eighteenth-century war between the Ottoman Empire and Russia. The Valida Pasha died in 1931, and her son was deposed in 1944, but the family managed to hang on to this unusual suite of jewels until 1963. That year, they were sold at Christie's, with the Russian provenance related clearly in the sale catalogue. They have remained in a private collection in Europe since then, but on November 16, they will be sold again at Sotheby's. 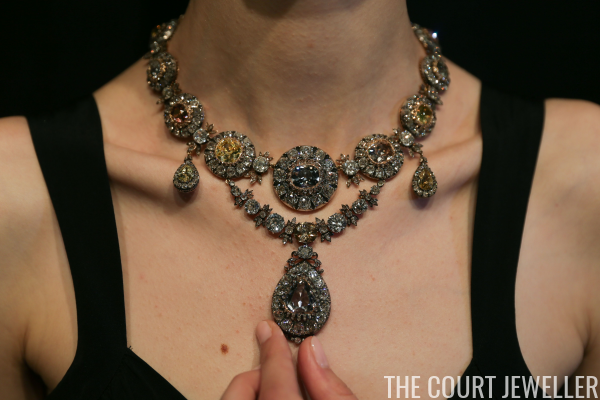 This time around, the auction estimate for the suite has been set at approximately $3-5 million.